Ancient texts show that milk thistle has been utilized since antiquity to protect liver health and treat liver-associated ailments and gallbladder disorders. Scientifically known as Silybum Marianum, modern science shows that the milk thistle fruit and seeds contain a group of biologically active flavonoid complexes, collectively known as silymarin. Silymarin is believed to hold the key to milk thistle’s gentle but powerful liver-supportive health benefits. Milk thistle is commonly used in Traditional Chinese Medicine primarily for the purpose of eliminating toxic materials, clearing heat and supporting liver function. In modern herbal medicine, milk thistle is believed to support liver health, and may be especially useful as an adjuvant therapy in chronic liver conditions. Optimal liver function is critical to all aspects of health. As the largest internal organ, the hard working multi-tasking liver has a role in over 500 vital life-sustaining functions. Some of these roles include: bile production to carry away waste and aid digestion of fats; production of cholesterol and certain proteins that carry fats throughout the body; conversion of excess glucose into glycogen for storage, and back into glucose as needed for energy production; blood clotting regulation; iron storage for hemoglobin use; conversion of poisonous ammonia to urea to be excreted; immune system modulation through production of immune factors and bacterial removal from the bloodstream; bilirubin elimination; and last, but not least, clearing the body of pharmaceuticals, OTC and recreational drugs, alcohol, toxins and other harmful substances. The liver is the only organ that is able to regenerate and can, in many cases, replace damaged tissue with new cells. Milk thistle has been shown to help promote and expedite the replacement and repair of damaged liver cells. 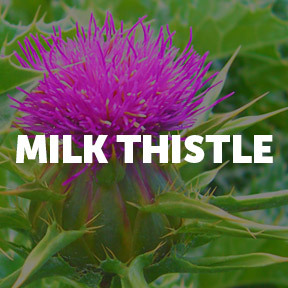 Milk thistle is known for its hepatoprotective, antioxidant, antiviral, and antifibrotic properties, as well as its immunomodulating and anti-inflammatory effects. Its hepato or liver protecting properties lie in its potent free radical scavenging activity, as well as its contribution to glutathione production. This ability to maintain and increase the cellular content of glutathione is thought to be instrumental in preventing cellular damage. Known as the body’s master antioxidant, glutathione is found naturally in every bodily cell. Glutathione is a powerful fighter of oxidative stress, helps to maintain immune function, and combats heavy metal and drug toxicity. Heavy alcohol consumption, aging, unhealthy diet, chronic disease, infection, constant stress, poor sleep habits and sedentary lifestyle all contribute to glutathione depletion. Per the National Institutes of Health (NIH), silymarin has a short half-life and fast conjugation in the liver with principal excretion in bile, indicating it should be used with repeated oral doses as a means of controlling hepatic inflammation. While more studies are needed on the benefit of silymarin in the treatment of liver diseases, available evidence shows that silymarin may play a complementary therapeutic role in alcoholic liver cirrhosis, non-alcoholic fatty liver disease, hepatitis and in some cases, liver cancer. Milk thistle is thought to reduce damage to the liver caused by free radicals, produced as the liver metabolizes toxic substances. Bottom line, we are bombarded with a barrage of environmental toxins daily, resulting in an ever-present health threat. For proper short-term liver detoxification, as well as long-term liver support, milk thistle may turn out be one of the best friends your liver ever had. Silymarin‘s long history of use supports a good safety record. Those who are allergic to any member of the aster family of plants, such as ragweed, chrysanthemums or marigolds, should not take milk thistle. Additionally, those who have a chronic liver ailment, who are pregnant or taking medication, should always check in with their healthcare provider before taking milk thistle or any OTC formulas or supplements. Silymarin Milk Thistle Extract by Pure Encapsulations®: Each capsule provides 250 mg of silymarin marianum extract standardized to contain 80% silymarin in support of antioxidant defense, cellular protein synthesis and overall healthy liver function. Hypoallergenic, gluten and soy free, Non-GMO vegetarian formulation. Milk Thistle Max-V by Douglas Laboratories®: Each vegetarian capsule provides 250 mg of silymarin marianum standardized to contain 80% silymarin to help maintain and encourage normal healthy liver function. Soy free, vegan formulation. Nanoemulsified Milk Thistle by Quicksilver Scientific®: Nanoemulsified Milk Thistle convenient liquid formulation provides 30 mg of milk thistle extract in support of liver health and protection and healthy digestive function. Super Milk Thistle® X by Integrative Therapeutics®: This vegetarian nutritional formulation provides bioavailable standardized milk thistle extract blended with supportive botanicals for support of heathy liver function. Free of gluten, dairy, wheat, yeast, sugar, preservatives and artificial ingredients.